This is the view from our road while coming home from town the other day. John got out of the car to unlock the gate at the EXACT same time this rain cloud hit. 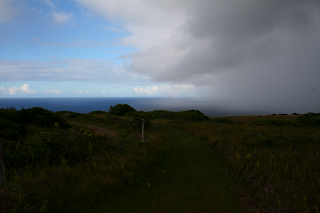 I love the stark contrast of the 2 skies when the rain storms move across the water like this.